Photo by: National Fire Protection Association, via MarthaStewart.com. Long Island, NY - October 26, 2015 - With Halloween just around the corner, children will soon be out in costume trekking through festive displays in search of candy. However, more than ghosts could be lurking amongst the mid-fall fun, as Halloween costumes and decorations present a number of hidden fire hazards. Fortunately, by following some simple safety precautions from the National Fire Protection Association (NFPA), you can ensure a day of safe fun for your family and trick-or-treaters. “Halloween has become such a festive time of year and we want people to enjoy decorating their homes, wearing colorful costumes and getting in the fall spirit,” said Lorraine Carli, NFPA’s vice president of Outreach and Advocacy, “but this holiday can quickly turn hazardous if proper precautions aren’t taken.” According to Carli, fire risks include candle decorations and billowing costumes with long-trailing fabric. NFPA’s most recent statistics show that decorations were the first item to be ignited in an average of 860 reported home structure fires per year from 2009-2013, causing an estimated average of one civilian death, 41 civilian injuries and $13.4 million in direct property damage. Nearly half of all decoration fires in homes are the result of decorations being too close to a heat source. Thirty-eight percent were started by candles and one-sixth began in the living room, family room or den. Visit the Sparky the Fire Dog® website to find tip sheets, kids’ activities, a pumpkin-carving template and more. Parents and teachers can also utilize NFPA’s simple Halloween fire safety tip graphic. In a safety video, NFPA’s Lisa Braxton says planning ahead can help make Halloween fire-safe. Taking simple precautions, like making sure costumes and decorations are flame-resistant, can make the difference between a safe and tragic holiday. Costumes: When choosing a costume, stay away from billowing or long-trailing fabric. If you are making your own costume, choose material that won’t easily ignite if it comes into contact with heat or flame. Visibility: Provide children with flashlights to carry for lighting or glow sticks as part of their costumes. If your child is wearing a mask, make sure the eye holes are large enough so he/she can see clearly out of it. 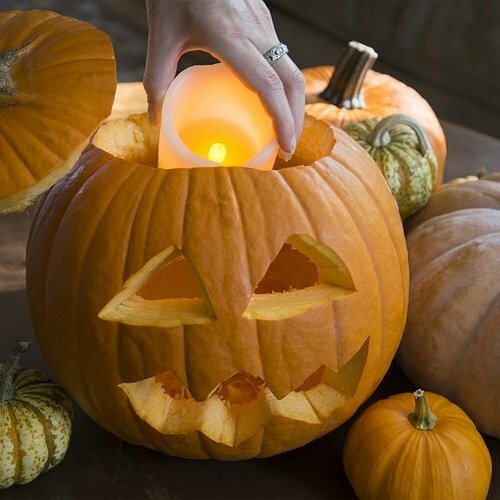 Candles/jack-o-lanterns: It is safest to use a glow stick or battery-operated candle in a jack-o-lantern. If you use a real candle, use extreme caution. When lighting candles inside jack-o-lanterns, use long fireplace-style matches or a utility lighter. If you choose to use candle decorations, make sure to keep them well attended at all times. Do not leave them near flammable objects or where trick-or-treaters may walk. Remind your children to avoid open flames. Make sure children are watched at all times when candles are lit. Exits: Remember to keep exits clear of decorations, so nothing blocks escape routes. Founded in 1896, NFPA is a global, nonprofit organization devoted to eliminating death, injury, property and economic loss due to fire, electrical and related hazards. The association delivers information and knowledge through more than 300 consensus codes and standards, research, training, education, outreach and advocacy; and by partnering with others who share an interest in furthering the NFPA mission. For more information visit www.nfpa.org. All NFPA codes and standards can be viewed online for free. Subject: LongIsland.com - Your Name sent you Article details of "Enjoy a Safe Halloween with NFPA’s Fire Safety Tips"